Video game designer Abel Alves is bringing Mandy into the 8-bit era of gaming. Alves is currently hard at work on the project, which still needs a lot more tinkering before we all get a shot at playing it. Panos Cosmatos' horror-revenge movie starring Nicolas Cage was an unexpected hit this year, gaining a cult audience in a matter of weeks who are all impressed by the unique visuals and Cage's excellent performance. 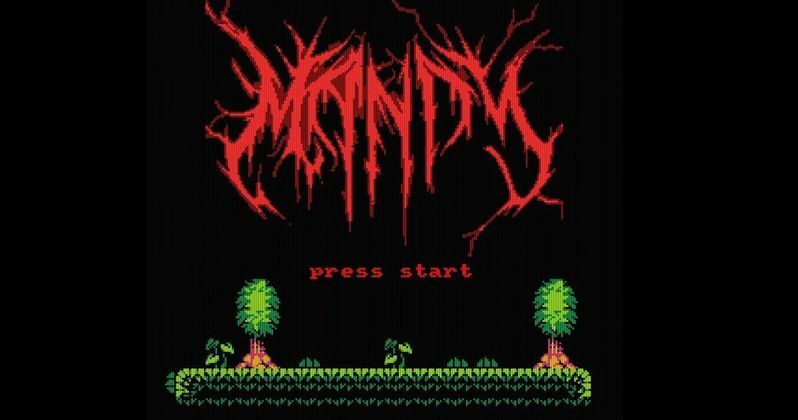 Abel Alves has shared his title screen, which shows the Mandy logo in all of its 8-bit glory with the iconic "press start" phrase directly below, practically begging us to drop it into an emulator and play it. Additionally, Alves has shared a screenshot of his bonus stage, which features the popular Cheddar Goblin. As for the style of the game, it looks like it will probably be side scrolling, but the Cheddar Goblin stage looks like a Legend of Zelda-style overhead type of game. Alves has yet to reveal what style game it will be. However, he already has Mandy producer Elijah Wood wanting to play it, who said that he "cannot wait to be able to play this!" The Nintendo Entertainment System was known for releasing horror-themed video games over the course of its history. A Nightmare on Elm Street and Friday the 13th weren't the only franchises to get the 8-bit treatment from Nintendo. Monster Party and Castlevania were not only awesome for their horror content, but for the excellent game play as well. Castlevania is now a hit animated show on Netflix. Uninvited was another great horror game released on the console. Over 30 years later, it's relatively easy to construct an 8-bit-stye video game. It's unclear what Abel Alves is using to program the game, but it definitely looks pretty awesome. NESmaker is a new company that has crowdfunded over $250,000 off of an initial goal of $32,000 for a project that allows users to make their own NES games without any coding. Even cooler, the games are cartridge-based, giving fans something real and tangible to either keep or sell to other fans. With that being said, making a video game is not an easy undertaking, so let's hope that Alves is able to complete his Mandy game. Mandy hit theaters this year with a retro-style look that was made possible with the Arri Alexa camera and the Panavision anamorphic format, so it seems only fitting that the movie would be getting the 8-bit video game treatment. Though the movie was released on VOD back in September, it has been screened at select theaters since then, and can still be seen in certain cities. It's unclear just how far along Abel Alves is with the Mandy game, but we should get some updates soon, especially since so many people are excited for the project now. You can check out some images from the game below, provided by Abel Alves' Twitter account.